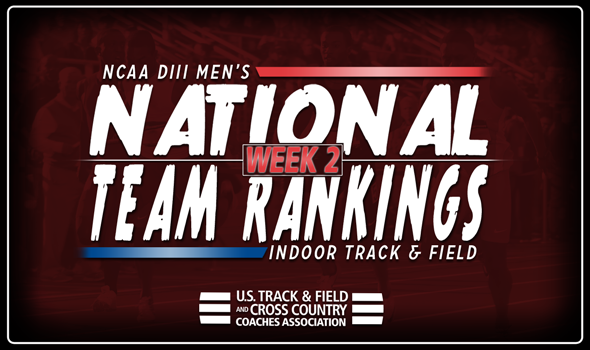 NEW ORLEANS – A staggering number of teams changed spots in the NCAA Division III Men’s Indoor Track & Field National Team Computer Rankings. Only three teams in the top-25 remained in place from Week 1 – No. 1 North Central (Ill.), No. 14 UW-Stevens Point and No. 23 Delaware Valley – while 18 teams moved multiple spots either up or down. MIT jumped four spots from Week 1 and comes in at No. 2. The Engineers saw Aidan Gilson clock a time of 8:17.03 in the 3000 this past weekend and take over the No. 3 spot in the USTFCCCA Individual Rankings. Gilson wasn’t the only MIT athlete who stood out as Yorai Shaoul recorded a mark of 14.67m (48-1¾) in the triple jump and is now No. 7 in the rankings. Mount Union is ranked No. 5, a four-spot improvement from Week 1. This is the first time the Purple Raiders have been ranked in the top-5 since Week 4 of 2016. Mount Union received a trio of stellar performances this past weekend from its 4×400 relay (which is now ranked No. 1 in the USTFCCCA Event Rankings), Mason Plant in the 60 hurdles (No. 4 in the rankings with his time of 8.05) and Louis Berry (No. 4 in the 60 with a time of 6.83). UW-Whitewater is back in the top-10 at No. 6 thanks to the effort of Alex Duff in the heptathlon. Duff tallied 5133 points this past weekend and surged to the top of the USTFCCCA Individual Rankings. He and Parker Witt should give the Warhawks a solid one-two scoring punch once the postseason starts. St. John Fisher and UW-Eau Claire are ranked No. 11 and No. 13, respectively. The former saw its DMR team moved up to No. 5 in the nation, while the latter received big marks from David Kornack in the shot put (16.96m/55-7¾) and Darin Lau in the 3000 (8:17.39). The biggest jumps came between No. 18 and No. 22, where Haverford, Bates and UW-Stout take up residence. The Fords vaulted 65 spots after Dylan Gearinger and Greg Morgan turned in top-5 performances in the 3000. The Bobcats’ DMR team is ranked No. 4 in the nation following its 10:13.47 outing. The Blue Devils welcomed back Sam Elsner, who turned in a pair of top marks in the shot put and weight throw. Make sure to check back in throughout the season as the rankings will continue to evolve in advance of the 2018 NCAA Division III Indoor Track & Field Championships, which will be held March 9-10 in Birmingham, Alabama.